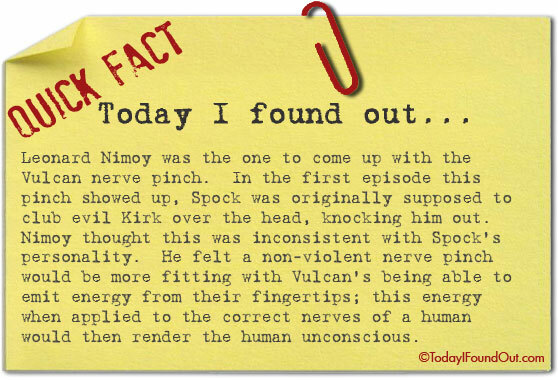 Leonard Nimoy was the one to come up with the Vulcan nerve pinch. In the first episode this pinch showed up, Spock was originally supposed to club evil Kirk over the head, knocking him out. Nimoy thought this was inconsistent with Spock’s personality. He felt a non-violent nerve pinch would be more fitting with Vulcan’s being able to emit energy from their fingertips; this energy when applied to the correct nerves of a human would then render the human unconscious.